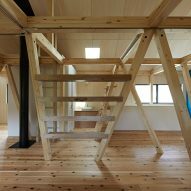 Clusters of diagonal columns splay out like tree branches inside this house completed by Japanese architect Kensuke Watanabe in the seaside city Kamakura. 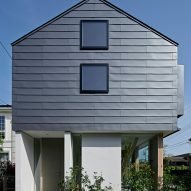 Named after the initial of its owners, the 144-square-metre Y-house was designed by Watanabe's Tokyo-based studio for a couple and their three children. Intended to reference surrounding trees, the house's structure features several sets of angular spruce wood columns. 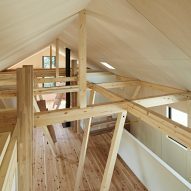 These branching elements support the gabled roof and floors of the two-storey dwelling. They also integrate furniture and function as informal partitions – an approach previously used to create a forest-inspired canteen in Spain and a culture centre in Netherlands. 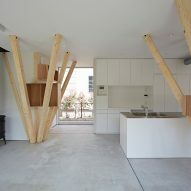 "On the ground floor, these columns appear as trunks of trees, making the space open and in continuum with the garden," said Watanabe"
"In contrast, on the first floor the columns become dispersed and one may feel like they are surrounded by branches." Externally, the house is clad in horizontal steel slats at the top, which contrasts with the white walls and glazing at ground floor level. On the south elevation, box windows extend out towards the garden. Entering the house, occupants first meet the tree-like columns in a living space where shelves nestle between the timber to create storage. Within this open-plan living area, which comprises a dining room, lounge and kitchen, there are three sets of exposed diagonal columns. Two bathrooms are located off to one side. Four Douglas Fir veneer doors are sandwiched between full-height windows to allow different sections of the room to be opened to the garden. A concrete floor unites the interior and exterior, by extending out to a raised platform that surrounds the house. A minimal kitchen featuring floor-to-ceiling cupboards conceals the staircase that leads up to bedrooms, bathrooms, a small mezzanine and a family room. The exposed structure of the property creates partitions to divide spaces on the first floor. 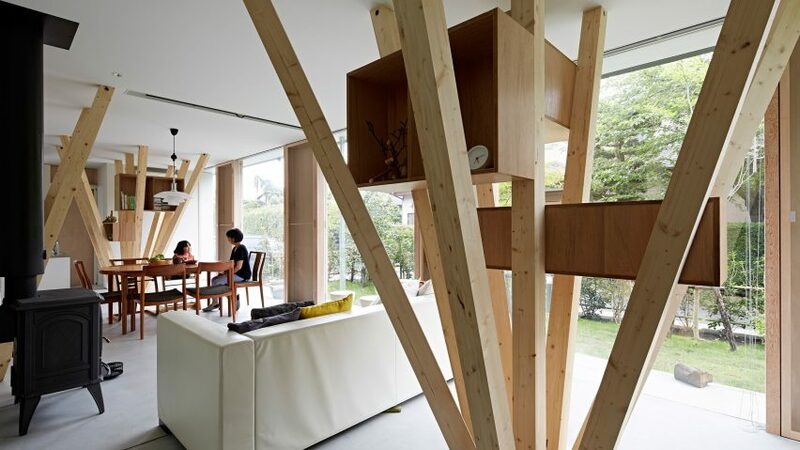 Bookshelves and walls sit beneath and between pine beams and diagonal columns, forming areas for play and sleep. The open-plan twin bedroom doubles as a playroom, with a ladder leading up to the mezzanine above. The master bedroom and study sit behind a blue wall, where a shelf with a hanging rail forms an open wardrobe. There is also a balcony here, supported by the diagonal columns. To finish the space, plywood sheets were applied to the sloping ceiling, matching the Japanese cedar floorboards on this level. Kensuke Watanabe founded his studio, known as KWAS, in 2005. Past projects include a Corten-clad gallery and a rehabilitation centre for mental illness sufferers. He sees Y-house as a case study for how nature can inspire building structures. "In contrast to modern architecture models, which are more universal, this system is pursuing an architecture that blends and respond to ambient context," he said.